On May 11-16, 2011, just as the dry summer months abruptly morphed into the rainy "winter" season in Nicaragua, I left the familiar of the United States and traveled to an entirely different world. My purpose in going to Nicaragua was to bring your blessed encouragement and support to one of Lamb & Lion's newest and youngest supported evangelists — 30 year old Donald Dolmus. The differences between the two nations are at first starkly obvious. Nicaragua is a nation which has been crushed economically under the politically oppressive years of Daniel Ortega's socialist government, a government openly hostile to the United States and Israel. Socialism has left the people in abject poverty, second only to Haiti as the poorest Gulf of Mexico nations. Their people are denied land ownership due to outrageous interest rates and well paying jobs are rare. Many sell food like rosquillas (kind of like pretzels) on little tables on the side of the road to make ends meet. Signs of this depression can be found everywhere throughout the country by the almost total lack of maintained infrastructure, like good roads and water/sewage. When the garbage on the sides of the roads builds up too much, it is burned, producing smoking fires everywhere. Like the worst inner city neighborhood, their entire capital of Managua reels under high crime and violence, and so all homes are encased in wrought iron and barbed wire with only a tin roof to keep out the rains. 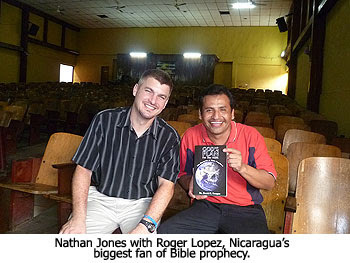 Nicaragua also suffers spiritually under gross apostasy, and there the similarities to America are striking. Catholicism in its purest idolatrous practice dominates the culture, and the Protestant denominations are rife with Kingdom Now and "name it and claim it" false theology. In response to his growing dismay over the sorry state of the Nicaraguan church, Donald began using any free time he could to devote to his preaching and online ministry En Defensa de le Fe (In Defense of the Faith) at www.endefensadelafe.org. He's using his bilingual talents to translate a good number of our ministry's articles and repurposed them on his website, extending our ministry's outreach far into the Spanish speaking world. 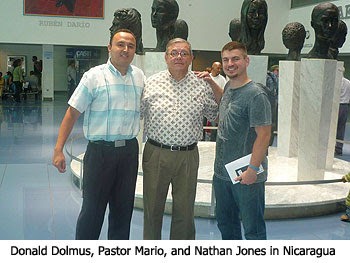 He was encouraged by his friend Carlos, who himself has three blogs supporting Israel and teaching on the Millennial Kingdom. En Defensa's website statistics reveal that in the Spanish speaking world there's a deep hunger for learning about Jesus' soon return. One such person is Roger Lopez, a humble janitor at Donald's bank who making only $150 per month spends what funds he can scrape together to buy materials on Bible prophecy. I got the pleasure of meeting Roger and deliver one of Dr. Reagan's God's Plan for the Ages books which he received with such joy. He showed me his binder of printed Lamplighter magazines and how though not knowing English, he uses a dictionary to translate word for word into Spanish. Now that's a passion for God's Word! 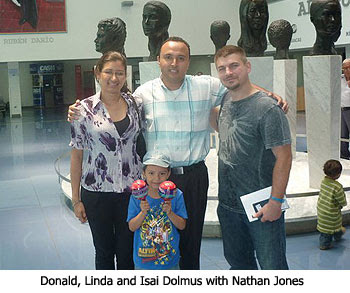 Donald's church, Camino de Santidad (Way of Holiness), is like an oasis in an ocean of doctrinal confusion. The congregation just loves Pastor Mario and praise his devotion to sound biblical teaching. That teaching sure shows as the congregation sat so attentively to Donald and my Saturday Bible prophecy conference. While I spoke on Heaven and Israel, Donald translated, as well as preached himself on Replacement Theology. They sat for two hours per sermon listening, a timespan few Americans would endure. They followed up by a deep Q&A time and held the most vibrant prayer time afterwards. That church sure knows how to worship! I left Nicaragua feeling an "eternity" moment. You know, that coming time when all of God's people despite origin, tribe and tongue will dwell together as brothers and sisters in Christ one day. It'll be a blessed time where we all share the one thing that unites us — our passion for our Lord Jesus Christ. 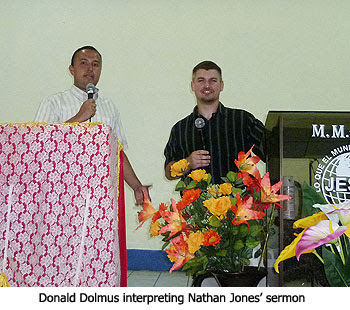 I got a taste of that in Nicaragua, and I hope you do too in getting to know Donald Dolmus and his wonderful Bible prophecy ministry. But wait! Weren't you raptured like all the other Christians on Saturday? Oh wait! I guess I guess that was a false alarm, too. Hello Nathan!! Greetings in Jesus Name, Carlos Chamorro Schutze your Friend, Brother in Christ and Driver here in Managua, God Bless all the Lamb and Lion Ministries Staff, and of course all the readers of this Blog and the Web Site, and the Christ in Profecy Show. The Fish from the Lake is Tropical gar, Atractosteus tropicus, reported to reach lengths of up to 1.5 m in the wild (albeit often much smaller in captivity). The tropical gar looks very similar to the longnose gar in color and markings, but can be distinguished by its shorter, broader snout. The tropical gar's diet consists mainly of cichlids and other fish. One of the most exhaustive pre-millennial works ever written on the Kingdom of God exhibiting profound scholarship and extensive study of literature, history, science, theology, and prophecy. Peters quotes from over 4,000 different authorities from the early church fathers to the end of the 19th century. Peters unfolds the entire scope of prophetic truth related to the Kingdom. Is the Hero an Israeli perchance? Super pics. By the looks of things you all got ahead of the job! Hello Sue, that Book, The Theocratic Kingdom is from George N. H. Peters (1825-1909), during a long life of increasingly debilitating sickness and near-blindness, produced the most exhaustive single work of pre-millennial thought ever published. Born in New Berlin, Pennsylvania, and after graduating from Wittenberg College, he pastored a number of Lutheran churches in Ohio.His encroaching blindness, however, did not stop him from writing several commentaries on New Testament books and other subjects, although The Theocratic Kingdom is the only work presently in print.He titled himself an "Evangelical Lutheran Minister." George W. Dollar, in his work A History of Fundamentalism, declared him as a First Generation Fundamentalist in America. He was not well accepted among his own brethren (the Lutherans at that time were staunch post-millennialists, when Mr. Peters was pre-millennial). Yet, he preached alongside many great preachers inside Fundamental and Baptist circles during the Prophecy Conference movement. Your post appeared to me as 'dry' humour,which is a rather British trait. I thought you were referring to the actual Bible. As few in the world 'get' our sense of fun, I should have known better. I'm afraid my English eccentricity got the better of me. I have given my wrist a good slap and I am so sorry for the confusion! If they are preaching Dominion Theology or the "Name it and Claim it" variety we can surely identify who brought this false doctrine. It seems America exports a variety of products.